The powwow committee increased the size of its budget this year, allowing more drummers and dancers to compete and perform than at previous powwows. Committee co-chair Evan Barton ’20 said investing in the drum and dance prizes not only brings more competitors to the powwow, but also draws more spectators to the event, resulting in a more accurate representation of native communities. This year’s powwow brought five competing groups to the arena, which was new for the powwow, Barton said. The host drum group, White Bull, traveled from Wyoming to participate. Also present was a drum group representing the Abenaki, a local tribe with significant numbers in Maine, New Hampshire and Vermont. Head staff member Shelby Snyder ’21, a Fancy Shawl dancer, grew up attending powwows and traveled across the U.S. and Canada with her family to participate in them. Drum groups come in two distinct styles. Northern drums are higher pitched and faster in beat, while southern drum groups sing deeper and sometimes slower songs. Both types of groups were present at the powwow. Various styles of Native American dance were also represented. 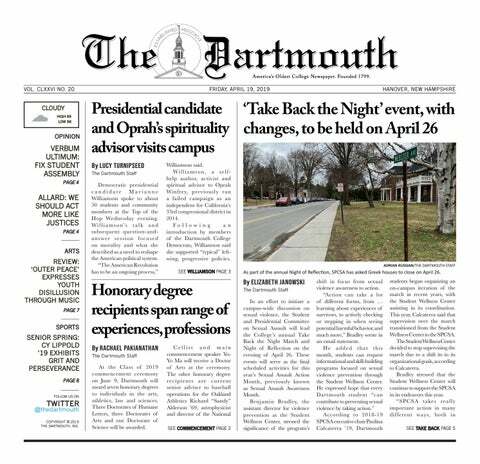 The Dartmouth Powwow highlights the men’s Eastern War Dance and women’s Eastern Blanket Dance because they are commonly performed by many northeastern tribes, Barton said. Other styles featured at the powwow included Traditional, Fancy, Jingle Dress and Grass. Snyder is a Fancy Shawl dancer, the newest style represented at the powwow. The Fancy Shawl dance originated from Native women who wanted to dance like men’s Fancy dancers and has transformed into a tribute to the butterfly, she said. While dancers usually incorporate a number of key moves into their routines, specific movements are usually not choreographed before each performance. “For the most part, you have moves that you know and you do a lot and are kind of consistent in that way, but it’s more like improv — you know the moves, and depending on what song you get, you just dance,” Snyder said. Powwow dance specials — specific dance contests organized by members of the head staff — are an exception to the improvisational style. Because being a member of powwow head staff is seen as an honor, members reciprocate that honor and give back to the circle with a special pre-coordinated routine. At this year’s powwow, dancer Darshina Yazzie ’19 put on a special for all the Jingle Dress dancers. Special dances usually function as a separate contest of sorts, involving performances complete with matching outfits and dances coordinated to a powwow song. To an extent, the powwow movement has become pan-Indian, Barton said, meaning many tribes adopt traditions and practices from other tribes. Jingle Dress is traditionally Ojibwe, for example, but Yazzie is a member of the Navajo tribe. Powwow staff member Arviso Alvord ’20, who sold their beadwork as a vendor at the powwow, said that Native American jewelry is another art form that grew out of the pan-Indian tradition. According to Alvord, Pan-Indianism was partly a result of the efforts of Native Americans who attempted to revive Native arts and culture by coming together as survivors of Native American boarding schools in the United States and Canada. Up through the 20th century, many Native American children were forcibly removed from their families to be “educated” at Native American boarding schools, which operated under the goal of "assimilating" them. Though the powwow represents the celebration of survival against the odds of genocide and oppression of indigenous peoples inscribed in the history of American education, issues still remain. Several powwow staff members reflected on their current concerns surrounding the powwow as an institutionally supported event: its success depends largely on student labor without enough institutional financial support. Barton agreed that he would like to see the College provide more institutional support for the powwow so the event will continue to grow in the future. Breanna Sheehan ’20, who worked alongside Barton as co-chair, said she hopes that the powwow can receive a bigger budget and more recognition for the work that Native American students do on campus. The committee is building on the minimum budget that they are currently working with, she said. Increasing the powwow budget has been a continual struggle for the staff, but students have also been working to make more immediate changes. While organizing last year’s powwow, co-chairs Shelbi Fitzpatrick ’19 and Anna Reed ’19 helped secure the position of a two-spirit head dancer in addition to the head woman and head man dancer. Barton and Sheehan want to solidify the two-spirit position at the powwow. Correction Appended (May 16, 2018): This article was updated to clarify that Native American boarding schools were not necessarily Christian boarding schools, though most had an element of forced Christian assimilation.